It was hot. The strap from the blue Ikea bag was cutting into my shoulder as we stood waiting for boats to clear the dock. The launch dock officials approached me and called out my bow number. “My side to waist, and down,” I called to my crew of eight women. It was Masters Nationals, and the Massachusetts summer heat had turned the launching line into a testy, dusty mess of rowers and coxswains and boats. "Just let us get on the water," I thought to myself. I knew, once we launched, we'd find our rhythm and the quiet that always precedes a race. As a coxswain, you probably know what this feels like. You’re in the middle of a long train of boats trying to launch. Your crew is hot and cranky, and the comments about carrying the boat are, for some reason, directed at you. And now, as you catch the eye of the race official who has just tested your heel ties for soundness and caused one to fail, you know the launching of your boat is not going to happen anytime soon. “To shoulders, and up,” I called, my rowers a bit confused, not yet aware of what was happening. We side-stepped our boat to a dusty section of ground. I opened my cox kit and hoped that I had one remaining heel tie to solve the problem that was standing between us and our race. This probably isn’t what the engineers at Shimano were thinking about when they decided to apply the technology the company had so successfully introduced to the cycling world to our sport. This probably isn’t what the rowers who have become avid Shimano fans think about each time they click their shoes into the Shimano footboards. And this certainly isn’t in the minds of the coaches who realize their boats can gain a competitive advantage by harnessing the power-transfer abilities the new shoe-and-footboard systems bring to a crew. But for me, on that hot afternoon as our race time was growing dangerously close, finding a viable heel tie was the only thing I could think about. Technological advances in rowing have been focused mostly on boat materials, hull design and weight. Most boats that are being made in this century are either at or below the FISA-required weight. Most shells are made from stiff materials that draw a rower to a particular boat manufacturer. But beyond that, how do you eek out a few more seconds of speed? How does a crew become the most efficient team on the water, able to edge out their competition? Shimano's answer is simple: ensuring the efficient transfer of power from the rower through the footboards to the hull itself. This transfer of power is akin to the pedaling motion in cycling, where the human body attaches to the bicycle and tries to get as much efficiency as possible. Shimano, a Japanese company that specializes in fine sporting equipment, was one of the innovators in cycling in the 1920s when they released a single freewheel to drive the rear bicycle wheel. They expanded their component line in the 1950s, establishing themselves as a mainstay in cycling components; Shimano derailleurs and shifters became standard on many high-end bikes. Over the next two decades, they began producing internal three-speed hubs (if you rode a townie bike back in the 1970s and '80s–you know, the three-speeds with the cowhorn handlebars–you probably had one of their hubs shifting your gears) and aluminum cranks. All along the way, they implemented a fine attention to detail that made their products sought after by many cyclists. Throughout every decade, they made innovations in the cycling world that are now considered standard-issue equipment. Some examples include the click-shifting of the Shimano Index System and the SPD pedals that established the clip pedal as the way to achieve maximal power transfer from the rider to the bike. This innovation alerted riders there was a better way to connect to their vehicle, there was a better way to build power on the drive. 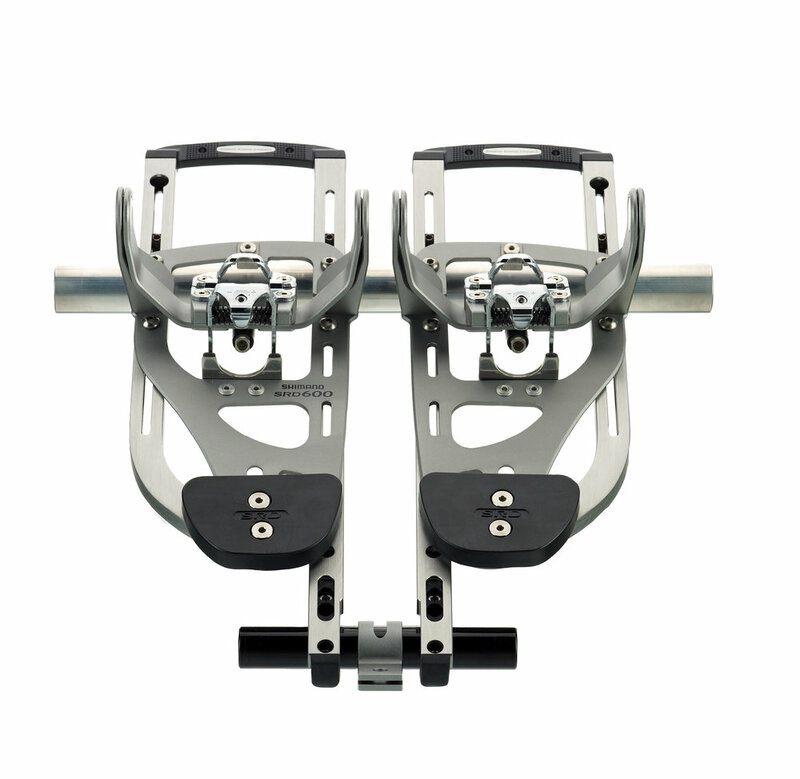 As a small athlete who was always looking for free speed on the bike, it wasn't strange, then, when I saw the Shimano footboards with an SPD clip and Shimano shoes with cleats in a rowing shell; it all made sense to me. "It's about power transfer on the drive," Ashley Myles, a Shimano representative, said to me, as she handed me a shoe to inspect more closely. The Shimano tent was near the landing dock of the race I'd finally gotten my boat to (I found one last heel tie in the bottom of my cox kit); I had ducked in to get a break from the afternoon sun. Myles told me that, yes, rowers were at about the same place cyclists had been in the 1990s when the SPD pedal first came out. The rowers that have made the switch to the Shimano system first comment, she says, on the feature that is perhaps the most basic: the fact that the Shimano footboards allow rowers to clip in once they get in the boat, which means rowers can have their own pair of shoes (no offense, teammates). Once they begin to row with the Shimano system, Myles routinely hears about how connected the rowers feel to the boat, as if the boat is an extension of their legs, and they can transfer their power more directly from handle to hull. I messed about with the shoes quite a bit, clipping them in and out of the demo footboards, and then Myles invited me to a local club that is in the process of converting as many boats as possible to the new system. Three weeks later, I found myself in a launch with Jamie Stack, a coach with South Jersey Rowing Club, which rows on the Cooper River in Camden, New Jersey. Stack explained that his club outfitted one shell and then couldn't keep rowers out of it. It's a new cost, though, so they've approached it this way: the club outfits the boats and the rowers take responsibility for their shoes. Parents and Masters alike seem to enjoy the fact that shoes are no longer shared among the team, and the performance of the rowers has–whether expedited by the new system or not–improved. "If you think you have the best gear, you hold yourself to a higher standard," Stack says. "It's crazy, but it's what I've seen happen here. I don't know the numbers relating to power transfer, but I know my rowers prefer the boats that have been converted, and they row better in those boats." Stack explained that the shoes and footboards are FISA-approved and they've never had any fuss at a regatta. After practice, the rowers in his boys varsity four affirm what their coach had told me. Unanimously, they prefer the Shimano-outfitted boat to any other. FISA has approved the Shimano system, as it provides for the safety standards of enough pivot to allow for the natural motion during the stroke, but the cleat releases if the rower is caught in a capsized boat and has to swim to safety. Voila, no more heel ties. That's a feature coxswains can love. The rowers in the boys varsity four affirm what their coach had told me. Unanimously, they prefer the Shimano-outfitted boat to any other.